The Noble was a pub opposite Crouch Hill Station. It closed down in mid-2015. As of August 2015 the premises were occupied by The Hopsmiths, run by Late Knights brewery, though this has also closed in its turn. According to the Feb/Mar 2018 London Drinker, it has now reopened again as Brave Sir Robin, run by Carouse London. 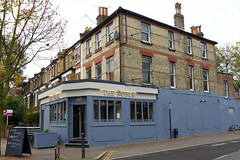 A pub opposite Crouch Hill Station, which has gone through a number of name changes in recent years (The Flag, and then Big Fat Sofa). It seems to have settled down (with a far more sensible name) to quite an attractive little drinking place. It's not a huge pub, but it has a number of large tables near the windows, and two or three tables outside. There are some comfortable sofas by an open fire, and some booths towards the rear, opposite the bar, where it's rather darker. On weekday evenings there's usually a bit of space and it doesn't fill up until later in the evening, but there's always been a pleasant vibe, with music playing (not too loudly). Staff have generally been helpful and friendly. Their regular ales on the two handpulls appear to be London Pride and Deuchars IPA, which always used to be dependably unavailable, though as of 2014 the range has been revamped a bit and the keg offering has had Camden Town's Pale Ale, Hells and Gentleman's Wit added. The wine list is good, and is sold at £4.50-£6 a glass (and £12.50-£30 for bottles), all good quality in Ewan's opinion. They serve food in the evenings, with a solid gastropub-style menu (mains are £10-15) chalked up on a board. Food is dependable and decent, with the good quality chunky chips often having been a highlight. Ewan's verdict: In general, I prefer the Noble to its nearby super-sized neighbour the Old Dairy. It also doesn't show sports (or even apparently have a television or screen), which is a bonus depending on what you're looking for. Despite the gastropub menu, there's no compulsion to eat (tables aren't laid for service), so it's been a relaxed and pleasant place for a drink over the five years I've been visiting. As of April 2014, there appears to be a pub quiz on Wednesday nights at 8pm, with a £2 entry fee. Last visited by Ewan and others, April 2014. Last edited 2018-03-03 17:42:31 (version 19; diff). List all versions. Page last edited 2018-03-03 17:42:31 (version 19).